Posted byDave the Wine Merchant	 July 14, 2007 Leave a comment on Waiter! What's this rat doing in my Chardonnay?! Meanwhile, Disney says Ratatouille’s Monday, Tuesday and Wednesday opening week grosses proved to be the biggest ever for a Pixar film… A lot has been made… about the difficulty of merchandising a kitchen rat. But I’m told the Soda Fountain Studio Store next door to Hollywood’s El Capitan Theater has been non stop packed with Ratatouille shoppers. (See photo). I’m told that the store cannot keep in stock plush toy rats and radio controlled rats. Also big sellers are chef hats and kids cookbooks. 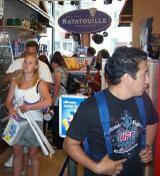 Other Ratatouille items for sale at either Disney Stores, mass retailers and specialty retailers include: Ratatouille Chardonnay (Costco), Ratatouille cheese (Costco), Ratatouille back-to-school items, Ratatouille kids cookware toys, Ratatouille kids home decor and cooking classes (Sur La Table). The news caused quite a buzz in the wine chat rooms (See Winelover’s Discussion Group). The general theme of the thread is that people are surprised Disney would market wine. Kids brand, adult beverage, insimpatico, no? Well, one would think. I had spoken to Disney about marketing Sideways Wine Club on their Cruise lines, and was advised to stear clear unless I had attorneys on retainer and a year I could dedicate to the effort. Neither of which I had. But now that Pixar is part of Disney, and needs to recover the $200 million spent to produce the movie, things are different. And I suggest trying a bottle or three once it hits Costco stores in August. Here’s why. You Just Might Be Surprised – Though I don’t expect the wine to be stellar, we might be surprised by the quality. Cameron Hughes makes wine for Costco and he is provides impressive bang for the buck by removing a layer of distribution costs. If Ratatouille Chardonnay is anything close to Cameron’s wines, it will be $13 well spent. An Important Movement – Much has been made of our nation’s decades-long march into obesity. AND, we’ve suffered through ~70 years of regulatory oppression made to appease those who think drinking wine is the first step in a long march into hell (probably right up there with French Kissing in the back seat of a car). The movie Sideways introduced a nation to the wine country, might Ratatouille convince families to stay home, make dinner, and share a bottle of wine? Or am I just an idealist?
. Help me continue this free blog by taking 5 seconds to vote here! The Best Chardonnay in California Costs HOW Much?